When Christina becomes seriously ill, her mother prays constantly for her, until one day a holy man appears on a white horse and takes her to his church to be healed. Christina returns to the family farm, where she runs to her parents to tell them about the holy “grandfather” who helped her. This true story, Under the Grapevine, A Miracle by St. Kendeas of Cyprus describes the miraculous healing of a young girl, the author’s grandmother, by a much-loved local Saint who lived more than one thousand years ago. 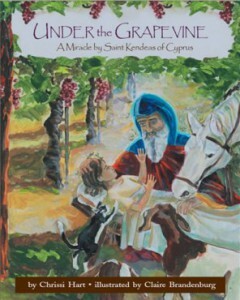 “…The writing and illustrations are beautiful, and the story guides both young and old to look to the Saints of the Holy Orthodox Church for Intercession with our Lord. It is even more uplifting to know that it is based on the true story of your grandmother, and her miraculous healing through the intercession of St. Kendeas. “…The simple language and the striking illustrations make it eminently suitable for both children and adults. Indeed, through the telling of this story the name of the saint will be glorified in the English-speaking world…. — Former Archbishop Christodoulos, Archbishop of Athens and Primate of the Orthodox Church of Greece. Memory eternal. Rev. Frank Marangos, D.Min., Ed.D. Basil (Vassilis) Siavelis, Cyprus Tourism Organization, NY, NY.